This post reviewing Year of Yes contains affiliate links. If you purchase an item through my link, I receive a small commission at no extra cost to you. 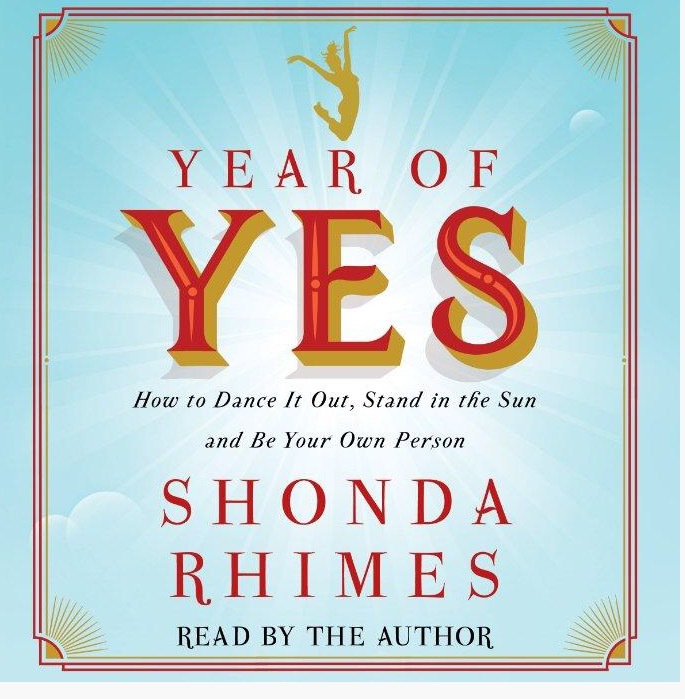 Year of Yes: How to Dance It Out, Stand In the Sun and Be Your Own Person by TV mega-producer, Shonda Rhimes (Grey’s Anatomy, Scandal, How to Get Away With Murder), is much different than I thought it would be. That statement stopped Shonda in her tracks. Her sister was right. She was busy as a single mom to three kids and at the time creator, writer and Executive Producer of two hit shows on ABC. Who had time for anything extra? Or that was what she told herself. The truth was that in spite of her success, Shonda was AFRAID. Afraid of so many things. So she decided to take the next year and say YES to everything – things that terrified her which included giving the commencement speech at her alma mater, Dartmouth College and appearing on Jimmy Kimmel Live. But it wasn’t just about saying yes to these big events. It is also about things that a lot of us could afford to say yes to – taking care of our health, having difficult conversations and playing with our children. I admit, when I picked up the book, I thought – “Great, I am going to be ‘guilted’ into adding more things to my already busy schedule”. But it wasn’t like that at all. It’s about looking at the things we say NO to and deciding if we would be better served by saying YES instead. Shonda’s year of yes resulted in tremendous growth for her. What do YOU need to say yes to? I was just thinking about this concept of saying “yes” the other day. Thanks for the recommendation! Brooke – great book. Makes you think and reconsider some things, that’s for sure! I am currently reading this book and I LOVE it! I will post a review soon! Great – eager to see your review on it. I loved the book! The competition is amazing in this season’s DWTS. I will be happy to see any of the semi-finalists win, but I think I like Ginger the best. Helene, we all LOVE Ginger! All who are left are most deserving. I predict Ginger, Paige, Nyle & Wanya in the finals. I hadn’t heard of this book, it sounds so good thank you for sharing it. I was so sad to see Jodi go too, the competition is tough. I wasn’t crazy about the judges dances either. I know. I was tough to see Jodi go. She looked so beautiful and I thought she was a great dancer. And she just seems like a lovely person, but the competition is tough. I think it will be Ginger, Paige, Nyle & Wanya in the finals. What do you think? I think you would really enjoy “Year of Yes!” Doreen. Hi Cathy! Saying ‘yes’ can be daunting sometimes especially when we don’t really want to do something because of fear. It is such a great feeling when we do open up to new opportunities. I usually write about not feeling guilty saying No to others when we stretch ourselves to please everyone. I must get a copy of this book and start saying Yes! It’s taken me a long time to learn to say no to things/activities I didn’t want to do. But this book is about saying yes to being more open and honest with ourselves & others. Great read. I think you will really enjoy it, especially given the focus of your message! That’s a very unique concept for a book and with someone as busy and creative as Shonda is I bet she found the results amazing.I need to think about doing that mayself. Toni – it’s a great book with a little different message than I anticipated. You should read it! I can’t wait to read this book. She is amazing, and what she has accomplished proves her theory is right! It’s a great read, Lois! Michele – I listened to Big Magic on audio then liked it so much, I bought it to read! You will love Year of Yes! This sounds like a book that would help most of us. Thanks for letting us know about the book. I really enjoyed it. The book was inspiring! Sounds like a good read! Glad I stopped by to check it out, though I may need one on a year of saying no…. 😉 I have a ‘yes’ problem. It’s a great book. Thanks for reading and commenting! I pinned this to my Entertainment board. I am so mad at Olivia’s father on Scandal, but the previews look great. So upset. I just heard Nashville was cancelled. Between Scandal and Nashville, I get my soap opera fix. Have you seen the season finale yet? And what the heck is ABC thinking about cancelling Nashville! I am stunned. There are so many dumb shows on TV. Why would they cancel a good one? Thanks for pinning my post, Janice! Thanks for telling us a bit about this book. Sounds interesting! I enjoyed listening to the audiobook! How I miss the DWTS weekly recap. I remember reading this post and let’s hope this comment takes this time. It did! Sure was a fun series to do together. Did you see that Maks and Val have their own show that they are touring around the country? They are so cute! I started this book this summer. Need to finish it before school starts. Great read! Sounds like a great book. Thanks for the recommendation. I was surprised – I thought it would be different than it was. Pleasantly surprised, though. I really enjoyed it! Very thought provoking indeed. I have a stack to read but I may just have to add this one!